The Bankruptcy Laws are designed to help people who are struggling with financial problems to obtain a fresh start. If you are having trouble paying your bills, facing foreclosure, repossession or creditor harassment, you may have considered the possibility of filing Bankruptcy. 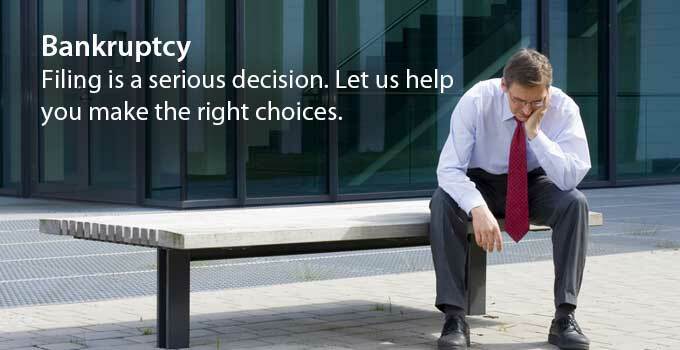 Filing Bankruptcy is a serious decision which should not be made without first consulting with an attorney. Our firm will personally assess your case to determine if filing Bankruptcy is the best option for you and will select the plan which best serves your individual needs. Sometimes Bankruptcy is not the best option or the time is just not right to file yet. If this is the case we will also let you know and unlike other firms, your Bankruptcy file will be handled by a lawyer and not by a paralegal. You may call us at (201) 653-7101 to schedule a consultation in our Jersey City, New Jersey office. Discharge most student loans, fines, and taxes. Discharge debts occurring after the Bankruptcy Petition is filed. Our firm is a debt relief agency. We help people file for Bankruptcy relief under the Bankruptcy Code.